Luken Baker drove in all three runs as the Peoria Chiefs shut out the Quad Cities River Bandits 3-0 in the first game of a Midwest League playoff series on Wednesday night at Dozer Park. The Bandits must win on Thursday night to extend their season. After three scoreless innings, Peoria used a long ball to take the lead in the fourth. After allowing just one baserunner in the first three frames, Edgardo Sandoval opened the frame by walking Yariel Gonzalez. Baker followed by blasting a two-run home run to left on a 1-2 pitch that gave the Chiefs a 2-0 lead. The Chiefs added a run to their advantage in the bottom of the fifth against reliever Leovanny Rodriguez. Nick Dunn opened the inning with a double and was joined on base shortly after when Nick Plummer walked. With one out, Gonzalez lined a soft single into center field to load the bases. Baker followed with a fly ball to center that allowed Dunn to tag and score from third, increasing the lead to 3-0. With the score still 3-0 and one out in the top of the eighth inning, the skies opened up and heavy rain began to fall. The grounds crew placed the tarp on the field and the teams waited out a 48-minute rain delay before play was resumed. The Bandits brought the tying run to the plate after back-to-back two-out walks in the eighth inning, but Kodi Whitley came out of the bullpen and struck out Scott Schreiber to end the threat. The River Bandits went down in order in the ninth. The Bandits mustered only four hits in the game, three of them coming in the second inning. Alfredo Angarita was responsible for two of the hits and reached base three times. Peoria ended the contest with nine hits. Gonzalez, Julio Rodriguez and Dunn each had two hits. Sandoval took the loss after allowing two run in his 4.0 innings on the mound. 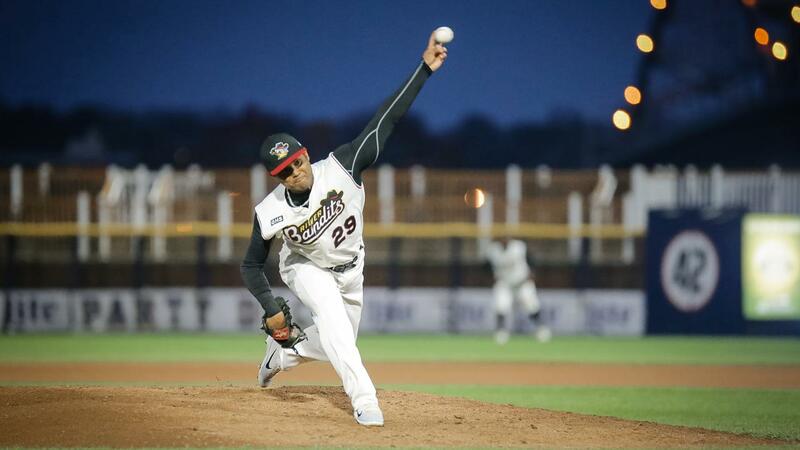 Leovanny Rodriguez followed by allowing one run in 1.2 innings. Tim Hardy and Carlos Hiraldo closed the night by combining for 2.1 scoreless innings and three strikeouts. The series shifts to Modern Woodmen Park on Thursday for the second game of the series. First pitch is set for 6:35 p.m. The River Bandits will hand the ball to RHP Chad Donato (6-0, 2.04) as Peoria goes with RHP Zach Pendergast (7-4, 3.08).